The last few months have been a lot of fun involving a trip to Porto, Portugal and enjoying living 2 minutes from Hyde Park. I don’t post on social media anymore so I thought I would start doing a post like this every 3 months to give a quick summary of what I’ve been doing. Enjoy! 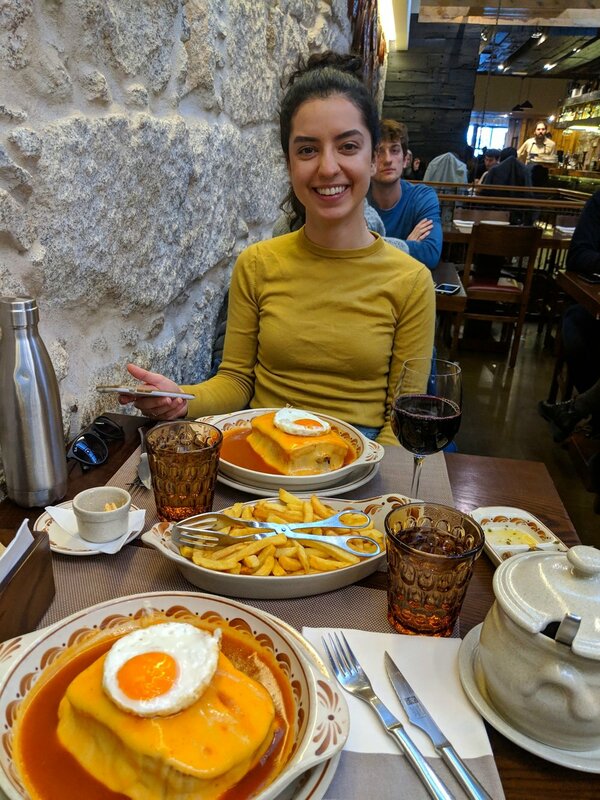 This is Portugal’s famous Francesinha. It’s a sandwich made with bread, wet-cured ham, linguiça, fresh sausage like chipolata, steak or roast meat, then covered with melted cheese and a spicy red sauce and topped with a fried egg. It is truly fabulous and also a pure heart attack. Back in London, I played my first gig in quite a while. Probably mid-way through forgetting the lyrics to Don’t Think Twice, It’s Alright in this picture. A song I’ve played a zillion times. This was a great night. In January, our friends Paria and Nino treated us to a dinner/casino night. Our dinner came with a £10 voucher for the casino next door which we could use in any game but couldn’t trade in for the £10 value. 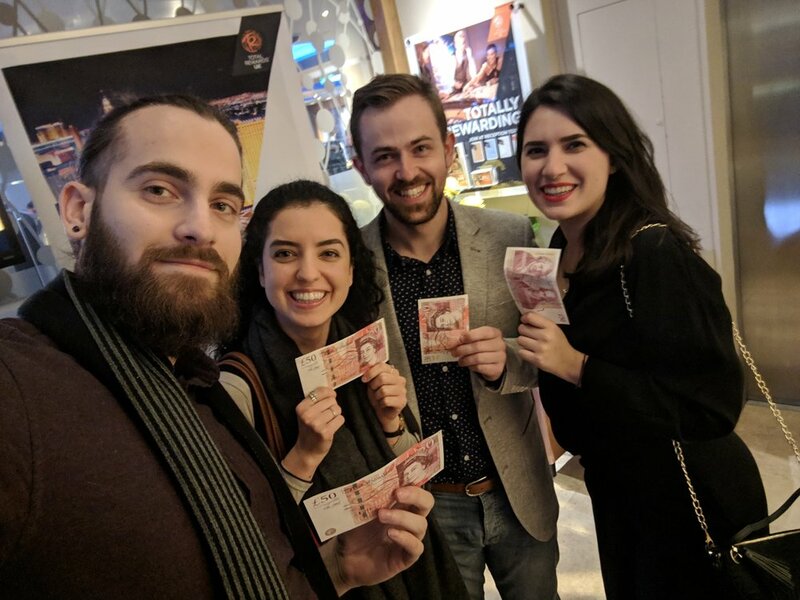 So we all decided that we would pair off and play 2 rounds of roulette, each placing our £10 voucher on red and black at the same time so we could at least get chips to be in the game. After this, we each had a £5 chip which we placed on the roulette table. I decided to not play the odds, and instead put the chip only on my favourite number, 8. We all placed our bets and watched the wheel spin and to my surprise, the ball trickled down into the 8. We all celebrated as the dealer (spinner? whatever they’re called) handed me £175 worth of chips. I then divided up all the chips minus £100 of it, between the 4 of us and placed more bets only to have Paria win again with some chips she placed on two numbers. This left us with £200 total which seemed like a nice round number to divide between four people. The Arab men who were putting down £10,000 bets each time were quite confused when we decided to call it a night. We were all buzzing afterwards but also deeply understood how one could gamble their life away while chasing that buzz. We decided to get out while we were ahead and snapped the picture above on our way out. I always have a book going so I thought I’d put any good ones I come across in here each quarter. 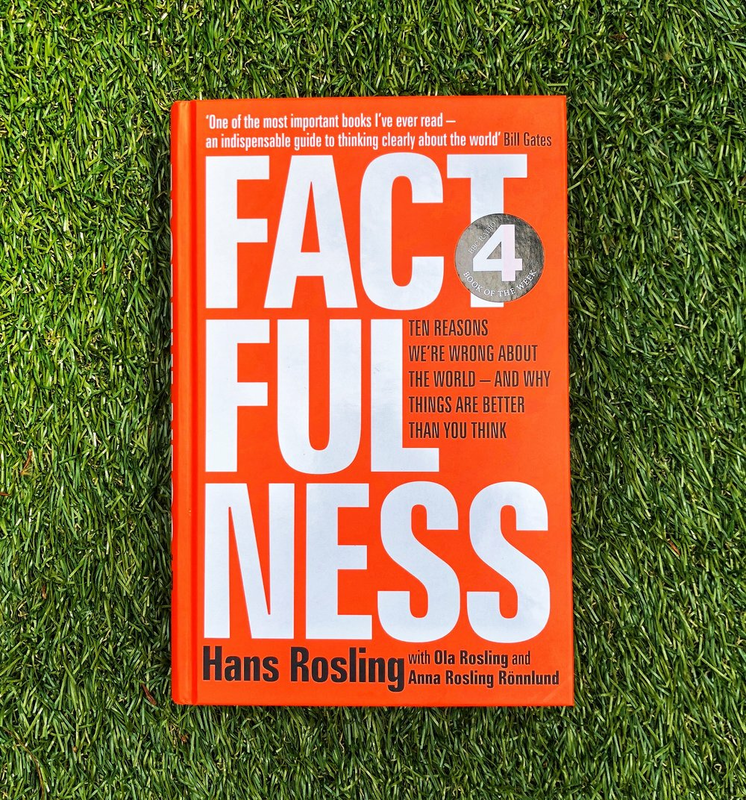 Rosling has since passed away but I found this book hopeful and mind altering. He shows there are things we can do to improve the remaining problems if we continue to work on them with a full understanding of the facts. Hint: Complaining about things on Facebook and watching CNN or Fox News doesn’t count. As someone interested in nutrition and fitness I had a hierarchy of health where I believed that nutrition was the foundation because if you got your nutrition right you could lose weight and then you’d have the energy to exercise and then you’d be tired enough sleep at night which would feed this cycle and you’d be on your way to a healthy body. This book has changed that. I still believe that you need to be doing all 3 of these activities well to achieve and maintain a healthy lifestyle but I now put sleep as the foundation. 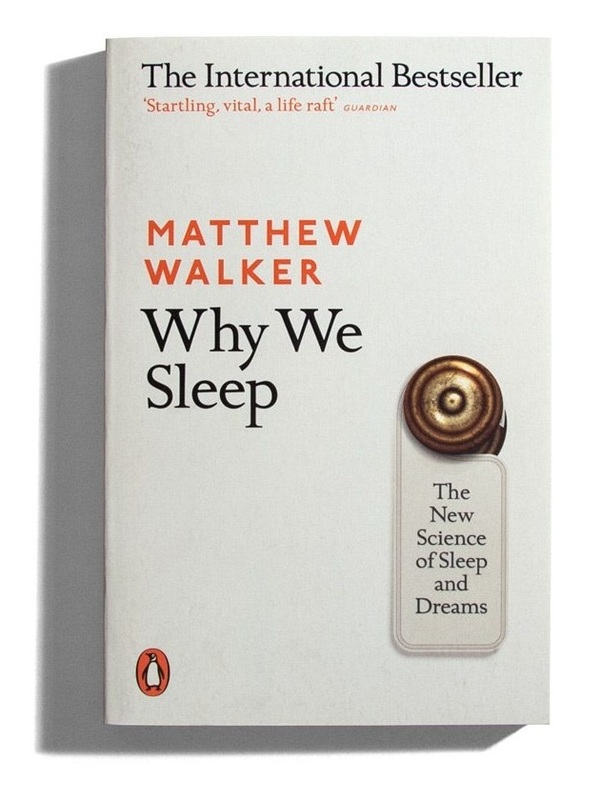 Walker explains how lack of sleep not only causes us to retain extra weight anyway but also contributes to us choosing less healthy foods which lowers our energy which makes us not want to exercise which then means we don’t sleep and before you know it, the vicious cycle is running in the opposite direction. If health is about managing feedback loops, getting the lead domino (sleep) right can make all the rest easier. From cancer, to heart disease, to Alzheimer’s, it’s abundantly clear that lack of sleep is at the very least a key contributor to these diseases, if not the main cause. Just for a little teaser on just how fragile we are without sleep, every spring when the clocks move forward 1 hour and we lose one hour of sleep, the rate of heart attack in the US goes up about 20%. In the fall, when we gain an hour of sleep, the rate of heart attack goes down by about 20%. Yikes. Parisa and I have been binging Game of Thrones for the last few months getting ready for the final season. I don’t think any further justification is required. This documentary is bananas. The story of Alex Honnold and his quest to free solo (a.k.a. climb without any ropes like an absolute mental patient) El Capitan in Yosemite. I’m convinced this could have been filmed on two iPhones and it would have still won the Oscar. I recommend watching with a towel close by for your inevitable hand sweat. The Drive with Peter Attia M.D. This is quickly becoming one of my favourite health and nutrition podcasts. It’s quite technical and I don’t understand half the words but Peter Attia has a great radio voice and is always on the cutting edge of longevity and prolonging “health-span” rather than lifespan. He believes by focusing on age as the metric for a healthy life, we end up over-prescribing and medicating. Instead what we should be focused on is trying to prolong the healthy active years of our life. I’ve listened to Tim Ferriss for a long time and his show runs the gamut from health, to business, to productivity and many other topics but a couple of my favourites are below. Episode 55 - Pavel Tsatsouline: Pavel is one of the top strength coaches in the world and has trained some of the top Russian athletes and power lifters over the years. I love this episode because it blows up this idea that we should be sore at the end of every workout and goes deep on where strength and mobility really comes from and why it’s important. Episode 138 - Seth Godin: I could listen to Seth talk every day. It sounds like he’s reading from a prompter but he’s really just that clear of a thinker. This episode has some of his thoughts on education which I think are spot on as someone who recently came out of the education into the working world. And of course, I’ve been listening to The Red Petals’ self titled new album which is just great. My brother JC is the lead singer and guitarist. This album has long been in the works and it shows. It’s a fully crafted bluesy piece of art so please give it a listen if you haven’t already. That’s it for this quarter but look forward to the next edition in June!